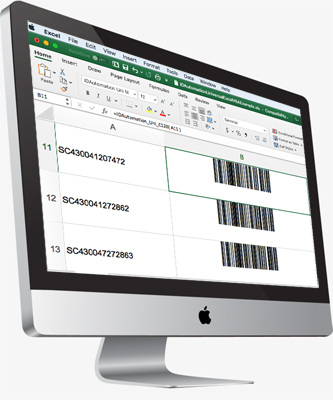 Creating barcodes in Microsoft® Excel® is an easy task with IDAutomation products. IDAutomation offers easy-to-use VBA macros, AppleScript and barcode fonts as well as ActiveX Controls. The Native Barcode Generator for Microsoft Excel provides barcoding capability to Microsoft Excel Spreadsheets with an embedded VBA macro making it easy to share sheets without needing to distribute additional fonts or other components. Code 39, Code 128, PDF417, Data Matrix and QR Code, MSI, GS1-128, UCC/EAN-128, Interleaved 2 of 5, Codabar, Postnet and Intelligent Mail IMb. Compatible for both Microsoft Windows and Mac OSX, 32 and 64 bit systems, for Microsoft Excel versions with VBA Macro support. Can generate Intelligent Mail (IMb), USPS-128, Postnet and Planet barcodes. This is a complete barcode generator that stays with the spreadsheet, even when distributed. Self-checking barcode fonts such as Code-39 may be easily used in Excel. This implementation is cross-platform compatible with both Mac and Windows. To use fonts other than self-checking versions, refer to the AppleScript for the Mac or VBA Macros. All self-checking barcode fonts require a start and stop character. IDAutomation’s Code-39 fonts can be easily generated in Excel by (1) using a formula to append the asterisks to the beginning and ending of the field and (2) selecting the font for the field. The example below creates the text for a Code 39 barcode in cell B2 from the data in cell A2. Using Code 39 in the Excel example below enter the formula in cell E3. If a large column of data needs to be bar-coded, where copying and pasting the barcode font formula into each cell would be cumbersome, then creating barcodes in an entire column would be essential. In this example, Code 3 of 9 barcodes are created in the Excel using the IDAutomation Code-39 Font. To use fonts other than the self-checking versions such as Code 128 or Interleaved 2 of 5, refer to the AppleScript for Mac OSX or VBA Macros. 2. Select that cell and choose Edit – Copy. After that, highlight the entire column by selecting the gray square labeled “B” at the top of the spreadsheet and choose Edit – Paste. The formulas may take a little time to re-calculate. 3. Change the data in the column to be the Code 39 barcode font. With the entire column that contains the formula highlighted, choose the IDAutomationHC39XS font. The barcodes will appear in the entire column. 4. With the entire column that contains the formula still highlighted, choose the appropriate point size. 12 points is generally compatible with all barcode scanners. If smaller barcodes are to be scanned, IDAutomation’s USB Plug ‘n Play Scanner can read this font printed as small as 6 points. With the entire column that contains the formula still highlighted, choose the center text option so the barcode is in the center of the field. Then, make the column wide enough so there is some white space between the beginning and ending of the barcode. To use fonts other than the self-checking versions, refer to the AppleScript for Mac or VBA Macros. To see a list of all fonts offered, view IDAutomation’s product index. After purchasing or downloading the ActiveX Control, it may be dragged, dropped and resized in a spreadsheet. 1. Within Excel, choose View – Toolbars – Control Toolbox, a toolbox will appear. 2. In the toolbox dialog, choose the More Controls button. 3. Then, select the barcode control from the list of available ActiveX Controls. Select the control installed starting with “IDAutomation”, and then drop it on a spreadsheet. After selecting it, the control will appear in the spreadsheet similar to a graphic image, resize the plug-in as necessary. To change the properties of the control such as barcode height and symbology type, right click on the control and choose properties. To link a cell to the data to be encoded in the barcode, enter the cell in the “LinkedCell” property of the control. 4. When finished, exit the design mode by choosing the design mode button.